A new laser etching machine has enabled CAI to design and manufacture an expanded range of dial designs incorporating new cutting edge processes. 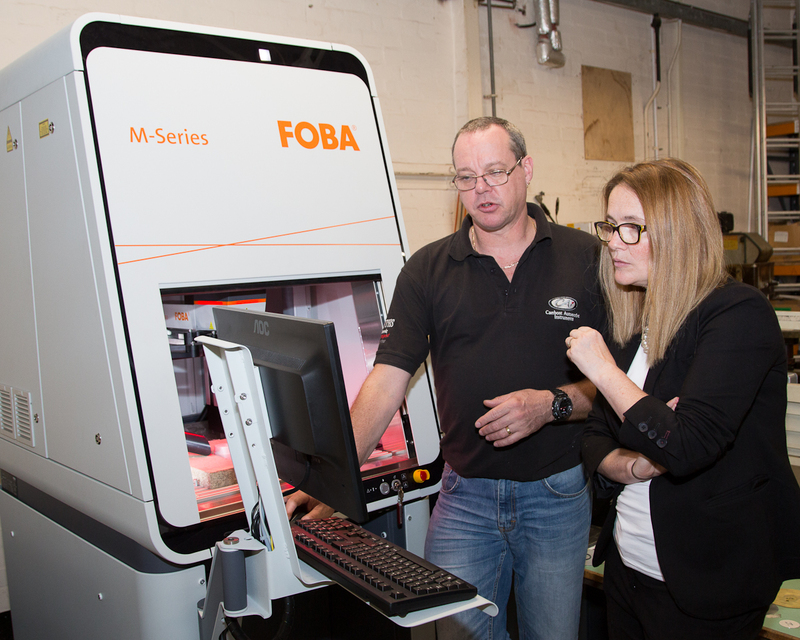 CAI purchased the FOBA Laser Engraving Machine with support from SMARTCymru. SMARTCymru offers financial support to Welsh businesses to help them develop, implement and commercialise new products, processes and services. Funding is provided by the European Regional Development Fund (ERDF). The FOBA M-Series Laser Engraving Machines engrave, mark, smoothen, frost and process different metals and plastics with exceptional reliability and precision. The compact manual fiber laser marking machine FOBA M1000 has been designed for the high-quality laser marking of small parts, medium sized components and work pieces and batches. Among others, the M1000 is ideally suited for laser marking autoparts, medical products, metal and plastic tools and general industrial products and components. The small and mobile universal marking workstation is also perfect for laser based contract manufacturing. The M1000 processes small metallic and plastic components but also batches both economically and in high marking quality. The design team are working on a number of projects requiring this level of accuracy. One project involves etching a design into a metal dial, filling the etched cavities with ceramic, anodising the metal substrate then machining the underside of the dial until the ceramic is exposed. Light under the dial will then illuminate the ceramic. "Adopting new technology enables us to increase the creativity of our designs," explained Gavin Roberts, CAI's Managing Director. "We are increasingly working on very high specification projects. These customers are producing cars, motorcycles and boats that are almost bespoke. We are designing and producing some visually stunning gauges." Without the new laser etching machine it would not be possible to manufacture some of the new dials. This has opened up new opportunities both in the UK and overseas.